I first saw some peanut butter shortbread cookies on Pinterest and was smitten. I LOVE shortbread cookies. So simple and so delicious. Being the mother of a child with a severe peanut allergy I was hesitant to make them out of peanut butter so I thought of Nutella. (I am fortunate that my daughter is only allergic to peanuts and can eat other nuts, though she rarely will.) Nutella is such a delicious product and works in recipes like peanut butter does. 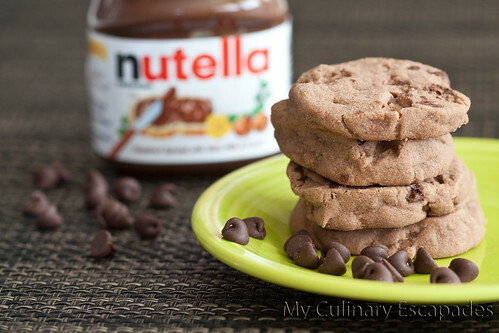 I had to try these cookies with Nutella and all I can say is wow. These are tasty little cookies. So delicious and the perfect crumb. Yum, yum, yum! Cream the butter and nutella together in your mixer. Once they are throughly combined add the vanilla and mix. These are so tasty you are going to want to gobble them all up.